Climateer Investing: Bank of England on Risk: "US Hurricane Clustering: A New Reality?" Bank of England on Risk: "US Hurricane Clustering: A New Reality?" Natural weather events such as hurricanes can cause significant loss of life, disruption to homes and communities, property damage and other economic losses. In addition, many insurance companies are heavily exposed to these events as they will insure property and other risks within areas commonly affected. The US Eastern Coast is one area where hurricanes are relatively common and where insured values are particularly high. As a result, it is important for insurers to consider the potential occurrence of hurricanes in this region, and the damage they might cause. The estimation of hurricane losses depend on several uncertain parameters including their frequency, size and intensity, the likelihood of making landfall, the accuracy of data on insurers’ exposures and historical meteorological records, property values in the affected areas, and the amount of rain and flooding. We focus in this paper on the observed frequencies of major Atlantic hurricanes. Our analysis suggests the frequency of the most intense Atlantic hurricanes with significant insurance implications could double in the future if recent observed changes in hurricane frequency persist. We estimate a 15% (a 1-in-7) chance of three or more major hurricanes making US landfall every year and a 0.6% (a 1-in-180) chance that these all impact the US East Coast (leading to potentially very high insurance losses). Insurance solvency regimes typically expect insurers to be able to withstand a 1-in-200 year shock. So a season with three or more hurricanes is within the spectrum of possibilities that insurers should consider. 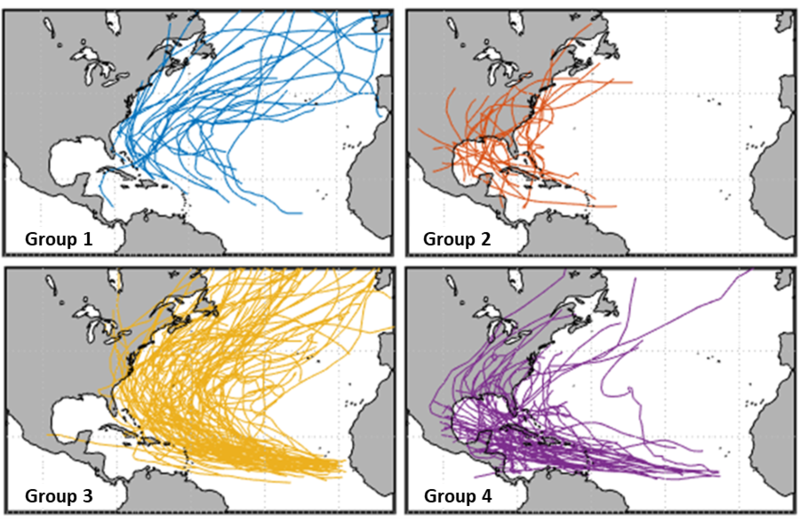 Kossin et al (2010) identified four distinct regional groups of Atlantic hurricanes. Their paper analysed all storms included in the National Hurricane Centre’s HURDAT database from 1950-2007. We have extended their analysis to include all storms up to 2017, using updated data provided by Suzana Camargo of Columbia University. The four groups, that pack together hurricanes with similar tracks, are shown in Figure 1. Group 1 storms form further north, over typically less warm water, and usually curve northwards over the Atlantic, thus have minimal impact on the US. Group 2 storms form mainly in the Gulf of Mexico. Although these often make landfall, they typically have limited time to develop into major hurricanes. Despite that, Group 2 includes hurricanes that led to significant insurance losses such as Katrina (2005), Sandy (2012) and Harvey (2017). Group 3 storms are the classic Cape Verde, high intensity deep-tropical storms. These develop over warm tropical waters off the coast of West Africa and have time to gather energy to develop into major hurricanes. A significant proportion curve to the north and miss the US. However, Group 3 spawns some of the most powerful hurricanes with the potential of severely impact the US East Coast. Examples include Gloria (1985), Hugo (1989) and Fran (1996). Group 4 storms are like Group 3, but originate further west and tend to maintain a westerly track, through the Gulf. Recent destructive examples include Andrew (1992), Ike (2008), Irma (2017) and Maria (2017). Of course if our old pal, the Atlantic Multidecadal Oscillation, is rolling over, the 2017 season may prove to have been the high point for the giant heat engines, for this cycle at any rate, and the re/insurers pricing off last year will have windfall loss ratios.